With the likes of Peaky Blinders and This Is England taking to the streets of Liverpool and Sheffield, just what is it that makes the urban world of Britain's vanished industries so appealing? "These are original cobbles," says Lynn Saunders, indicating the surface of Falkner Street, with its rows of red-brick terraced houses. One street over, she adds: "And these are ITV cobbles – they put them in when they came to film Sherlock Holmes." We're wandering around Liverpool's Georgian Quarter, along with Kevin Bell, Saunders' colleague at the Liverpool Film Office, and I'm getting an education. The first of its kind in the UK, their department was set up in 1989 to facilitate film and television productions in Liverpool. Now, they say, their phone is ringing off the hook. 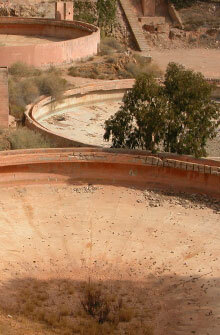 Enquiries are coming in from film-makers and TV producers looking for locations and resources. In the last few years, the city has already been featured in Peaky Blinders, Utopia, Foyle's War and many more. "On average," Saunders says, "it works out to about three productions a day." We visit a replica of 10 Downing Street, built for the new BBC drama Reg. (The presence of actors playing armed police demands the presence of a real police officer, watching to make sure curious passersby don't get too curious.) By the old tobacco warehouse at Stanley Docks, you can still see the evidence of last night's shoot for Houdini and Doyle: cherry pickers, used to install lighting. Britain's post-industrial cities are enjoying their first major boom in years – on the screen. There's a major new studio opening to service York and Leeds, Belfast's film location industry is thriving on the back of Game of Thrones and a new branch of Pinewood studios opened just outside Cardiff earlier this year. At the heart of this devolved production are the old powerhouses of UK industry – the buildings, the landscapes and the can-do attitude. Britain's post-industrial cities are attractive places: their industrial character persists, even as they evolve beyond heavy industry and the years of economic depression that followed its demise. 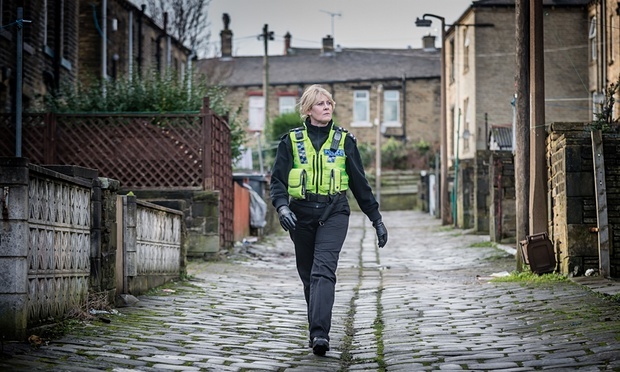 "Post-industrial landscapes become one of the characters in the production," says Kaye Elliott, head of production services at Creative England, a not-for-profit body set up to grow film and television productions across the regions. Elliott attributes the success of these cities to the popularity of "darker" stories, such as Happy Valley and No Offence. "Look at This Is England, which is shot in Sheffield. It's showing a gritty side. Obviously the city has much more to offer – but it is such a characterful place to shoot." Ian Rees is to Swansea as Saunders and Bell are to Liverpool. He shows me some recent locations: a pretty street next to the marina, used for the Dylan Thomas biopic Set Fire To The Stars; the former Copper Exchange, featured in Doctor Who; the art deco Guildhall, home to the council offices and currently a set for Their Finest Hour and a Half. London, too, has its fair share of atmospheric post-industrial landscapes. 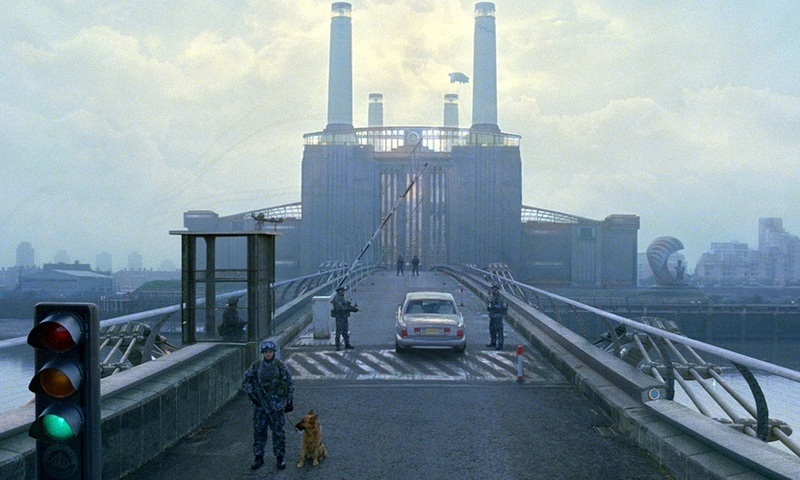 Who could forget the dramatic use of Battersea Power Station in Children of Men? Filming in the capital, however, is expensive, difficult and saturated. In Liverpool, for example, you're mobile, says Bell. "You can get to more than one location in a day. In London, you would get to one location and stay there." It's about more than just making life easier for film crews. 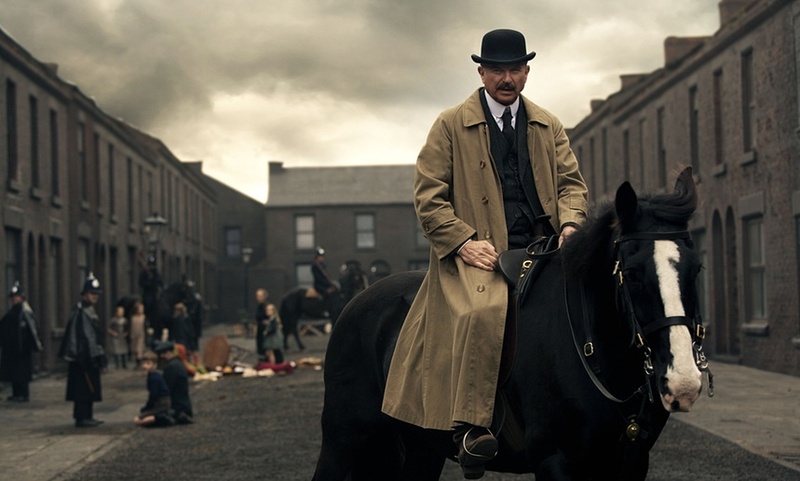 Jamie Glazebrook, the executive producer of Peaky Blinders, speaks of "monumental buildings", "a huge Victorian sense of ambition behind them that slightly rubs off on anyone who films there". He shows me a disused row of terraced houses on Powis Street in Toxteth, that was key to Liverpool's attraction for Peaky Blinders. It was this street – the site of the dramatic opening sequence, in which Cillian Murphy has a charm cast on his horse – along with the "incredible depth of the [Stanley Dock] tobacco wharf" that made Liverpool a natural fit. Powis Street is "a beautiful location," he says. "Something about the straight lines." Though it will be little comfort for former residents frustrated by the news that redevelopment plans have stalled, there's is now a window of opportunity for the TV industry. Indeed, there remain plenty of disused factories and warehouses awaiting regeneration, but they're not quite there yet. In their dormant periods, they can double as ideal (if draughty) spaces for filming. They're also often cavernous enough to build multi-storey sets. 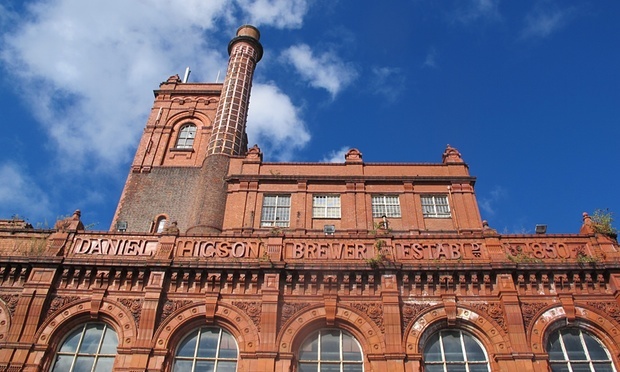 The old Cain's brewery on Stanhope Street, Liverpool, stopped brewing three years ago; big things are planned for its future. Tomato-red in the autumn sunshine, one warehouse is currently used by a business from nearby Chinatown to store rice and spring onions. Next door? A workshop where crews are building the inside of an Iraqi police station, for Reg. The building has also recently provided a production base for Cilla, Foyle's War and the new Stephen Poliakoff drama Close to the Enemy. "A gem like this – where you've got a large-scale space, proximity to the city centre, additional locations nearby – is rare," says Bell. Co-owner Sudarghara Dusanj chips in: "We haven't go no congestion charge up here either, do we Kevin?" In Merseyside, a new studio is planned in what, 10 years ago, was a Littlewoods factory. "Where they used to print the pools coupons," Saunders explains. "Previous to that, they built cables for Marconi. And before that I think they used to make bombs." Over in Swansea, meanwhile, Mal Pope and Ed Thomas set up YJB Films in 2013, basing themselves in Bay Studios, a former Ford factory. Signs from the car plant's canteen hang in what is now the graphics department. It's a vast site: the crew have bicycles to get around. Inside these gigantic hangars, whole sets can be built, and spaces joined up so that scenes can scan between them. They make their own props on site – I saw some quiveringly realistic snakes – and there is so much space, you can build sets in one area while filming in another. The factory has hosted the first two seasons of Da Vinci's Demons; the car park, meanwhile, has doubled as Machu Pichu and as rural Italy. Unlike many cities in North America, Britain's post-industrial cities also boast a range of architectural styles, which makes them good doubles for other places. "We can do New York, we can do Birmingham, we can do London, we can do the 1920s," says Bell of Liverpool. "St Petersburg, Rome, Chicago, army camps in the Middle East … " For a while, after a production set in "Moscow", Google Street View still showed part of the city dressed with Russian flags and signs. The city's Water Street, with its famous Cunard and Liver Buildings, stood in for 1940s New York in Stephen Frears' forthcoming Florence Foster Jenkins, starring Hugh Grant and Meryl Streep. "The way our forefathers designed this bit of the city – with a grid system – helped a lot," Bell says. "It also makes it easier to close down." This quick "switch" back to municipal concerns is a nice reminder that most of these cities have a film office embedded in the council. Bell, Saunders and Rees straddle the municipal and entertainment worlds, moving deftly between discussing high-octane car chases and the traffic management systems that facilitated them. This position, they say, makes them ideal for negotiating with productions: they know exactly how to organise road closures or get the streets swept. "You know what you can get away with and what you can't," Rees says. It can't hurt being just a few desks over from the parking permits department. With the industry booming, helped by tax incentives and investment funds, these are good times for the UK film and TV production industries. For places such as Swansea, which received European funding for the third time as one of the poorest areas in Europe ("Not a badge of honour," says Pope), film represents a fresh industry – and new, often highly skilled jobs. With over one-third of Welsh jobs in the public sector, the entertainment industry could help diversify the economy. Universities and colleges that used to specialise in trades now deliberately engage with the training needs of film and TV. Amanda Roberts, from University of Wales Trinity St David, runs a project at Bay Studios to build links between schools and production companies. It makes sense, given the university's historical links to industry: built on the foundations of technical colleges created by industry to train their workforces, Trinity St David has retained a strong vocational emphasis, and now even adapts its curriculums after consulting with film and TV houses. Roberts has a whole catalogue of success stories of students coming in for work experience and then getting paid commissions to work on Da Vinci's Demons. Students from institutions such as the Swansea School of Art "graduate locally with these very specialist, very developed skills that fit really well into film and television. Swansea hasn't been the most prosperous area," she says. "I think that if you told primary school kids that, when they grow up, they can work in film and television, it would seem so distant – it's America, it's not here." The fortunes of copper, shipyards and steel built the cities in which a new industry is now hoping to succeed. "If you get this right," Pope says, "this becomes the new Klondike, in a way."